My husband has been asking me to make a pumpkin pie all month. He even created a Pinterest board called Pumpkin Pies with over 45 pins of pumpkins pies and pumpkin inspired dessert and sent me an invite. Really? I love him though. I’ve been doing so much baking lately; pumpkin spice cakes, caramel cakes, pound cakes geez! There was no way I was gonna have a pumpkin pie in the fridge as well. My waistline is seriously telling on me these days, but I can never say no to this man when it comes to cooking his favorite things. It just lights up his world like a kid on Christmas. 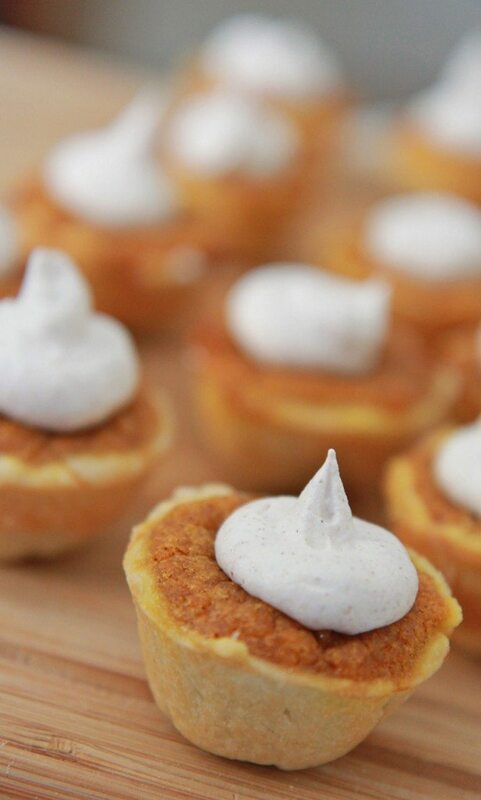 I figured these mini pumpkin pie bites were the perfect alternative to baking an entire pumpkin pie. They’re easy, packs in all the flavors of homemade pumpkin pie, portable and downright adorable! Everybody loved these little mini pumpkin pie bites and hubby and son requested them again. *rolling my eyes* I won’t like though, I think I like these WAAY better than regular pumpkin pit. They sure don’t last long at all because they are so doggone fun to eat and convenient. I think we have about 3 more in the fridge which I’m sure Isaac and Ethan will finish off tonight. The homemade pie crust is amazing!! It’s my go-to pie crust recipe for any type of sweet pie. It has the flaky, layered texture of pie crust with the buttery taste of a biscuit. The pumpkin mixture is sweet, creamy and perfectly spiced for such a tiny bite. I topped them with cinnamon cool whip, but I highly recommend piping on homemade cinnamon whipped cream. 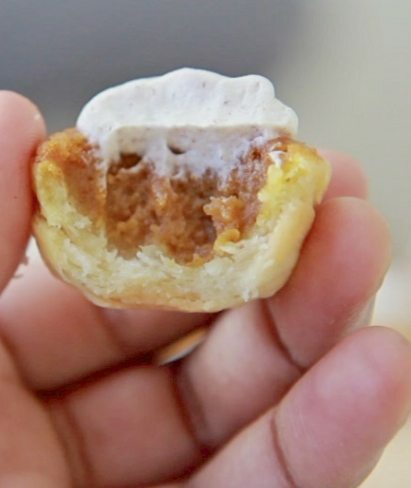 Make up a batch of these mini pumpkin pie bites and take them into the office. Then just sit back and watch how fast they disappear. 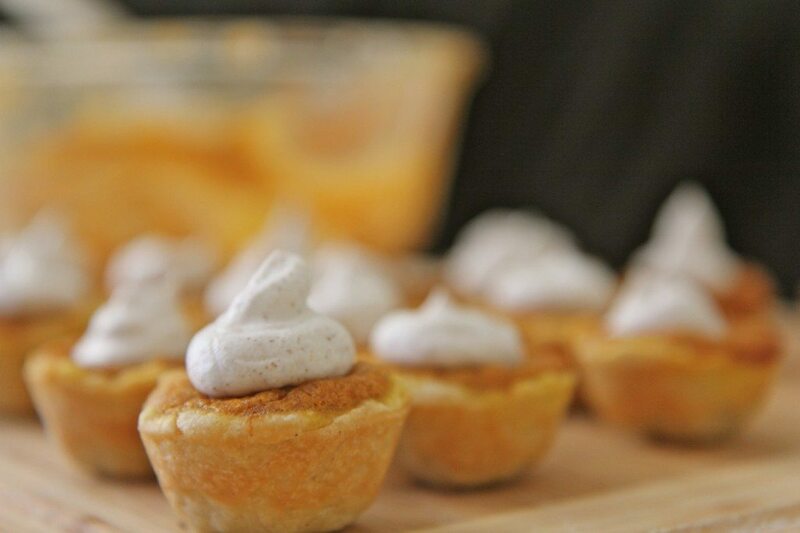 Watch me make these mini pumpkin pie bites from start to finish! In a medium size bowl whisk together flour, sugar and salt. Cut in butter and shortening until crumbly. Press dough into a disk. In a large bowl combine white sugar, brown sugar and butter until creamy. Fold in pumpkin. Batter will be speckled. When pie dough has chilled remove it from fridge and knead lightly a few times. Flour a work surface and pat dough out about ¼ inch thick. Use a small round cookie cutter to cut out 2-inch circles. Place the dough circles into a non-stick mini muffin pan. Press the perimeter of the pie dough so that they completely fill the tin. 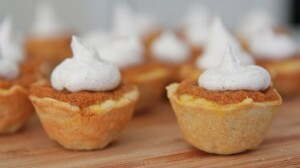 Use a fork to create ridges on the mini pie crusts if desired. Place the batter into the pie crusts using a mini ice cream scoop. Shake the pan or use a knife to level off the top. Bake for 25 to 30 minutes or until the centers of the pie is set. Be careful not to over bake. Pie may be a little jiggly when it comes out of the oven but will set completely as it cools. Pies will be puffy when they come out of the oven, but will sink back down when cooled. Cool pies on the counter and then top with cinnamon cool whip. Made these for a fundraiser…. Super yummy. Kids couldn’t leave them alone ???????? I’m wondering how much butter to use in the crust since I don’t use shortening. Also could I substitute lard for the shortening? Can I make these in the larger muffin tins? If so how long should the mini pies cook? I can’t wait to make your recipe.! Can you substitute the shortening with anything? I loved this recipe. I was always scared to make a pie crust for some reason but u made it look so easy n it totally was. Those pumpkin pies were the business!! Am I able to just make a regular pie ( non mini) with this recipe? Yes right?. Thank you so much. Love ur recipes they never fail me. Our family appreciates u mo!! Hi! It’s my first time making pies and I would just like to ask: Why do I need the ingredients to be cold? Oh, and I see some pie crust recipes with milk of some sort. What’s the difference if its with milk? :))) Thanks! I would like to know if I can substitute the pumpkin with sweet potato? I actually made this using sweet potato filling for Thanksgiving. My daughter had several friends over ( I had a house full of 17 & 18 yr olds….lol) and they loved them! If it weren’t for Monique I would have never thought of such a cute and easy twist on sweet potato pie. im from Philippines, im just starting to learn to bake mini pies….. Praise God! This is great I can have pumpkin pie without feeling guilty…cuz I love my pumpkin pie 🙂 Thanks! I LOVE your site and YouTube page. I love, love, love sweet potato pie. I hope you make mini sweet potato pies.